Question: I need a simple plan to get started working out this year. What should I do to improve my fitness and lose weight? Answer: There are four pillars of a solid fitness plan beginning with drinking water. Have coffee, milk or whatever beverage you prefer in the morning, as long as it’s not an energy drink or soft drink. The rest of the day you need to drink water, a minimum of 64 ounces a day. For the evening meal, you can enjoy a glass of tea that is marginally sweetened. For food, eliminate processed carbohydrate products. Eat plenty of fruits and vegetables during the day along with lean meat choices. Consume your carbohydrates in the form of oatmeal or whole wheat bread at breakfast along with eggs or another protein source. At lunch, you can eat a baked potato with minimal butter, a sweet potato or rice and vegetables. At dinner, it’s a lean meat and vegetables. Eat plenty of vegetables to fill you up. 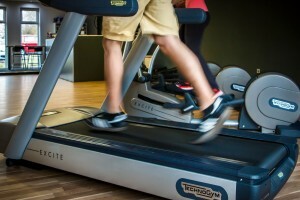 If you need to lose weight, begin your cardio with 15 minutes of walking uphill on a treadmill at maximum incline, without holding on, taking long strides at a moderate pace. If you need to break the time into smaller increments with two-minute rest periods, that’s fine. For weight training, work out at least two days a week, which means you’ll split your workouts into abs, back, chest and shoulders on day one. On day two, do calves, legs, biceps and triceps. As you progress, you could evolve into two full body workouts but for the first month, split things up. To sum it up, drink water, eat clean, cardio four to five days a week, and weights twice a week.